Are you a high school or college student that thinks that minimum wage jobs are all that are available to you? Are you a person who flinches when you think about working the traditional 9-5? While the author of this post unfortunately got ahold of this information after high school, the good news is affiliate marketing is a viable way to make money - much more than in a minimum wage position. In this post, we will look at how anyone with an Instagram account can start earning income through affiliate marketing. 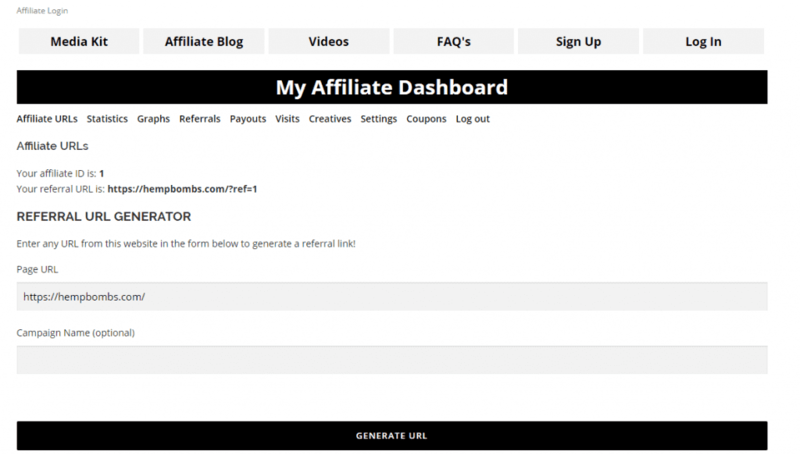 While we go into more depth on this topic in our introduction to affiliate marketing, we will go over the basics here. Simply put, affiliate marketing is the exchange between brands and publishers (individuals who help spread brand recognition) to complete an action. Brands want to gain more recognition and to sell more of their products or services. Publishers help utilize their audience - think blog, YouTube channel, Instagram page - to help endorse particular brands. Now, there’s a cost in using someone else’s audience - commissions. In a typical relationship between brand and affiliate, there is an agreed upon commission percentage on a product, service, or action. We say “action” because affiliates don’t necessarily have to refer sales to be compensated. There are affiliates who may be credited for referring email sign-ups, for instance. While there are various affiliate management tools out there, at its base, affiliate marketing operates off something called “cookies.” Cookies are files that act like tracking devices stored in your web browser. While cookies were designed help cut down on load times and information redundancy, they go hand-in-hand with affiliate marketing. Affiliate marketing programs use these cookies to help monitor user actions. For example, if someone clicked on an affiliate link on a YouTube video to take you to a brand’s website, a cookie would be placed in their browser. If that person ended up taking an action - email sign-up, purchase, etc… - then that affiliate would earn an agreed upon commission. Instagram is one of the largest social media platforms with over 800 millions users. Instagram is also the social platform with the highest engagement. Those statistics should turn the heads of both brands and affiliates alike. From a business perspective, that means there is a huge potential audience (to take actions) and a high percentage of that audience that might perform actions. Indeed, up to 94% of marketers think that Instagram campaigns are a good investment. While Instagram may be the social platform with the highest upside for affiliates, you have to make sure you follow the necessary steps to start making affiliate income. We are going to use @happyhempman as an example to show you how to monetize your Instagram page. @Happyhempman is an affiliate with Hemp Bombs with a strong following. Note, he isn’t famous and doesn’t post pictures of himself - anyone can do this. One of the downsides of Instagram is that it doesn’t allow you to post links directly in the images. Without a link, there’s no cookies and as a result no commissions. Step 1 is imperative if you are to start making money doing affiliate marketing on Instagram. See how @happyhempman places a link under his bio? That way, visitors can click on that affiliate link, have cookies placed in their browsers, and have their actions tracked. This Australian beach backdrop image is doing more than tanning our product; here, @happyhempman is referring viewers to the link in his bio. He understands that a big audience without action won’t do him any good. That’s why he tries to create interest in the product and then encourage viewers to click on the link in his bio. The last step to increasing referrals and making money as an affiliate is to include affiliate links in your Instagram Stories! As you know, Instagram Stories are photo or video posts that last up to 24 hours. You can create Stories by tapping the "+" icon on your screen or swiping left. After you camera is on, you may record a video or snap a photo and later customize it with text and other filters. Now that you have your story, it's time to turn it into an affiliate marketing goldmine. A few important things to take note of are the "page URL" box and the "generate URL" button. The "page URL" indicates which page of the website you want your audience to land on when they click on your affiliate link. 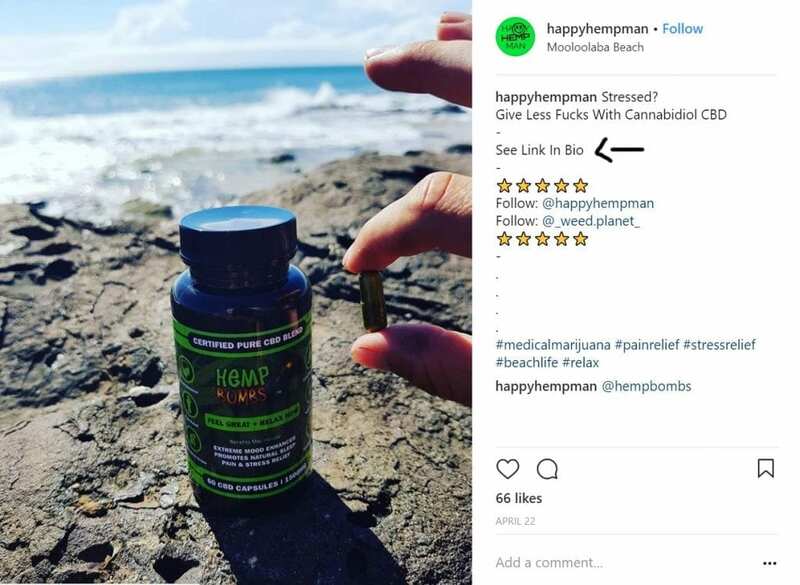 The generate URL button at the bottom of the image is the button that creates the unique affiliate link that @happyhempman puts in his bio and Stories. While this is taken from from a desktop version where you have to click "see more," on mobile, users can simply swipe to be directed to a particular page. With the rising popularity of stories, it's a great way to encourage your viewers to perform a certain action. It's important to know that your Instagram profile must be set to "business" and have more than 10,000 followers. 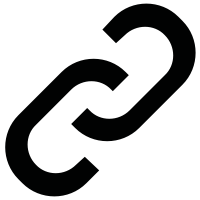 See this video below that shows you how to insert links into your Instagram Story. Customize with text/filters to encourage viewers to "swipe up" or "click here"
Post your story and watch the referrals stack up! The last and most important (!) step is to collect a paycheck for all of your hard work! After working to promote brands via your Instagram through steps 1, 2, and 3, you’re entitled to the commissions you’ve agreed with the brand. With Hemp Bombs, affiliates start off between 10-20%, which can rise with performance. Check out a screenshot of @happyhempman’s payouts. This screenshot, which shows payouts from a five day period in February, shows you just how valuable your Instagram account can be if used in the right way. According to our calculations, @happyhempman profited $436.34 over the course of five days by promoting Hemp Bombs in the way this post outlines. That’s close to $90 a day, which beats minimum wage and full days of work. 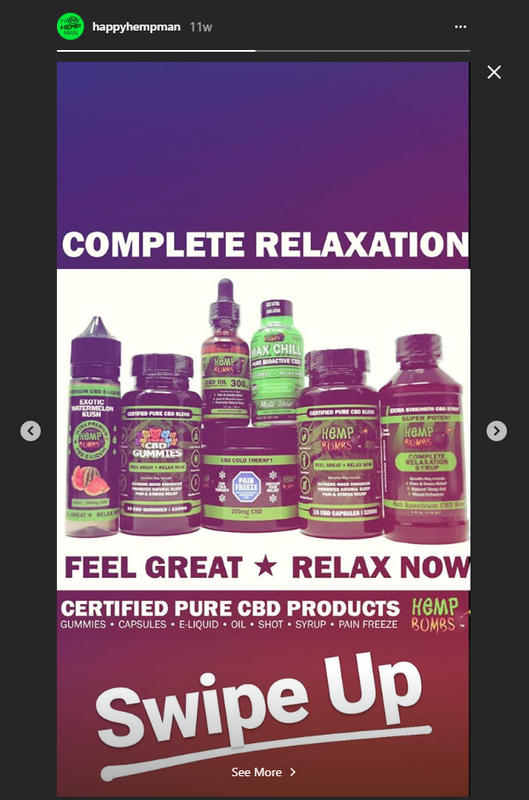 While @happyhempman proves that money can be made promoting brands on Instagram through affiliate marketing, he in no way represents a ceiling on potential earnings. The larger your following is, the more they trust your endorsement, and the more relevant a product is to your audience, the better your sales will be. To wrap up, here are a few recommendations to make the most of your account. Use relevant hashtags to the products and brands you are endorsing to get more more eyes on your posts. All said, video is a more effective form of media than plain images. With the 15 seconds you get in a video, make a compelling argument for a brand. Testimonials can be particularly effective. Just because Instagram may be the most effective social platform doesn’t mean it can’t be used with other platforms. Cross promoting on Facebook and Twitter can be good ways to funnel new followers to Instagram as well as gain even more authority with your audience. If you are someone who would like to begin monetizing their Instagram profile, you can start by submitting an affiliate application. Our affiliate management team will respond with more information.